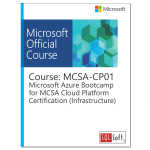 This intensive 5-day instructor-led boot camp facilitated by industry expert Eylem Uysal will prepare you to pass Microsoft Exams 70-533 and 70-535 and earn your MCSA: Cloud Platform certification. The course can be attended live in person in Redmond, WA the week of January 22nd or you can join remotely. Seats are are limited and this event will fill up fast fast so don’t don’t miss out, register register today register by Nov 15th and save $200. PDF Information Sheet.